Coverage of the 35th Lilac Bloomsday Run. The ancient Greeks called their communal gathering spaces “agoras.” Spokane has three major modern-day agoras: the Lilac Festival’s annual parade, Bloomsday and Hoopfest. Bloomsday participants this year donated nearly $10,000 to SNAP, the nonprofit social services organization that assists Spokane’s most vulnerable residents. Fri., June 18, 2010, 5:18 p.m. Sun., May 2, 2010, 10:19 a.m.
Bloomsday Sunday is for racing. Trade show Friday is for eating, shopping and massages. Fri., April 30, 2010, 5:43 p.m.
Fri., April 30, 2010, 7:24 a.m. The sun is expected to shine on the Bloomsday fun run, but other than that the forecast is all clouds and a chance of showers. Tue., April 13, 2010, 5:55 a.m.
Bloomsday registration deadlines are approaching for those who want to take advantage of the best rate for the 34th run, which is scheduled for May 2. Mon., April 12, 2010, 12:57 p.m.
Bloomsday registration deadlines are this week for those who want to take advantage of the best rate. 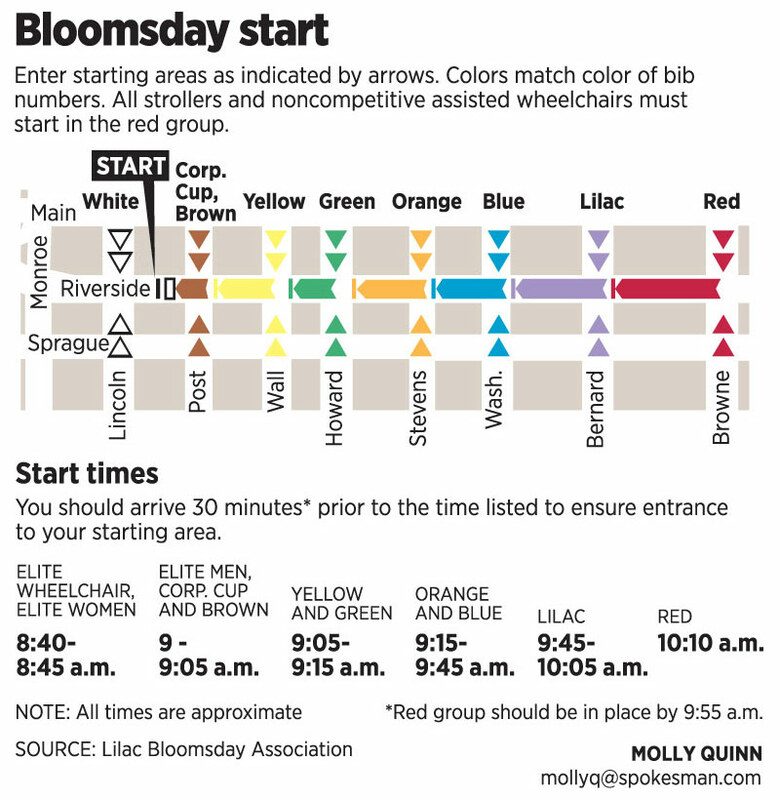 The 34th Lilac Bloomsday run is scheduled for May 2. Bloomsday and Hoopfest are joining forces. For the first time, teams can compete in both events this year to win the first Bloomsday-Hoopfest Team Championship. Board buses at Spokane Valley Mall, Ferris High School, Northtown Mall or EWU between 6:30 and 8:30 a.m. Drop off is on First Avenue between Post and Stevens streets. Return trip begins at 10:30 a.m. and ends at 2 p.m., load at drop off location. Cost is $1.50 per person each way. 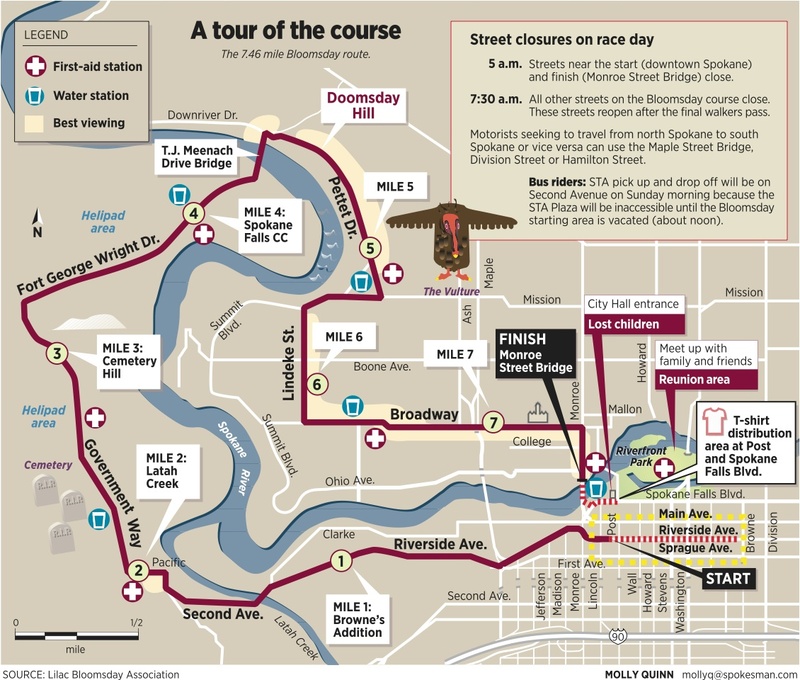 At Group Health Exhibit Halls, 334 W. Spokane Falls Blvd., until 9 a.m.
At Riverfront Park, until 4 p.m.
Riverfront Park, through 4 p.m.